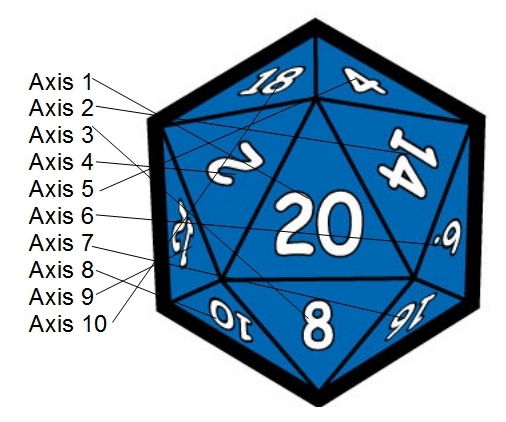 As mentioned in the Awesome Dice study, the GameScience d20 has a pretty serious burr on the 7 face, so when I was calculating the diameter of that axis I decided to do so both ignoring and taking into account the burr. Let’s see how it did! And here’s where the Opal, with and without the burr, stands compared to the previous measurements. Without the burr, this precision die is close to a traditional Chessex style die (black) and oddly not as good as the die from the original Red Box (green). The burr then, since it certainly is still there, is a real problem since it skews the axis in these measurements and affects the likelihood of rolling a 14 (as per the Awesome Dice study). So, in order for this die to be effective, removing the burr is something worth attempting in order to ensure that the shape of the die is uniform.